Neon signs are one of the most recognizable signs available. They are made from glass tubes which are filled with gas and phosphors used in combination to create a brightly-colored light. Neon signs are available in several striking colors and are a great way to get noticed. Please call (513) 407-4367 or email us to get started on your neon sign today! for interesting and insightful information about all things signs! 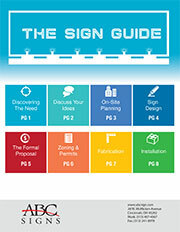 ABC Signs is here to make the sign buying process stress-free and painless with our free guide. ABC Signs knows sign buying can be tricky. Download our free guide to learn how easy it is to get started. "These efforts…brought a multitude of complimentary comments from the attendees of our open house about not only the aesthetic look of the awning, but also the location identification, value it provides our customers… [The awning] served as one of the key highlights of the day, and in my opinion, helps convey the quality image we want to present to our customers." "From April 1st 2010 through September 2010 ABC Signs completed 4 projects for us and received a 100% evaluation rating. Our account managers noted that the installation was completed on time and to our satisfaction following our processes, procedures and scope of work. Communication and responsiveness to phone calls, emails, etc was rated excellent along with our overall satisfaction of ABC Signs."